Shawn Donnan reported on Thursday at The Financial Times Online that, “After 14 months in office Donald Trump is delivering on his campaign promise to crack down on what he has long labelled China’s unfair trade practices by rolling out plans for new tariffs on up to $60bn in Chinese imports and other sanctions against Beijing. Charles Clover, Lucy Hornby and James Kynge reported on Friday at The Financial Times Online that, “Beijing signalled its readiness to go toe-to-toe with US President Donald Trump’s campaign of tariffs against China on Friday, proposing new levies on 128 American imports that heightened market fears of a looming trade war between the world’s largest economies. “China’s response to Mr Trump bore the hallmarks of a carefully calibrated warning. Beijing said it was planning tariffs on about $3bn in imports, including a 15 per cent tariff on US steel pipes, fresh fruit and wine, and a 25 per cent tariff on pork and recycled aluminum. But it also made it clear the measures were in retaliation for US steel and aluminium tariffs announced earlier this month and not the 25 per cent levy on up to $60bn of annual imports from China that Mr Trump unveiled on Thursday — raising the prospect of an even tougher response in the future. Last year, the U.S. pork industry exported $1.1 billion of product to China, making that country the No. 3 value market for U.S. pork. Jim Monroe, the NPPC’s Senior Director of Public Relations discussed the pork tariff issue in greater detail on the “Adams on Agriculture” radio program with Mike Adams on Friday. A replay of their discussion is available here (MP3- 4:30). In 2016, the United States was the second leading exporter of pork to the world market behind the European Union. Meanwhile, China’s demand for pork imports has increased the past several years. “China and Hong Kong together now constitute the world’s largest import market for pork. 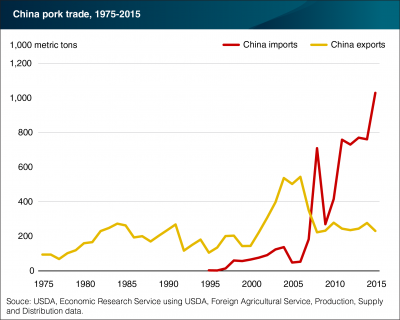 The United States was the leading supplier of China-Hong Kong pork imports during 2007-12, and the second-leading supplier behind Germany during 2013-15.” USDA- Economic Research Service, https://goo.gl/s4nEUx (January 24, 2017). 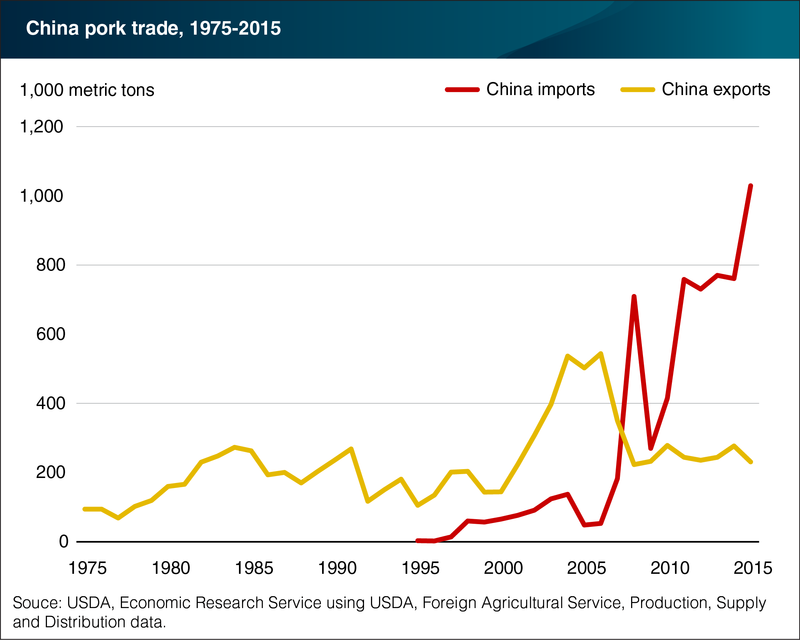 Despite this general increase in pork imports to China, more recently, pork imports have slowed. “China’s Saving Its Own Bacon in Trade War,” by David Fickling. Bloomberg Opinion Column (March 22, 2018). Tariff impacts on China aside, the repercussions in the U.S. are certainly unwelcome to pork producers from many Midwestern states– areas that are crucial in presidential electoral politics. Ethanol producers, too, are on the Chinese tariff hit list. “The country proposes increasing an existing 30 percent tariff on the fuel by an additional 15 percent. Kristen Leigh Painter, Jim Spencer and Tom Meersman reported on the front page of Saturday’s Minneapolis Star Tribune, “But for Minnesota’s 3,000 hog farmers, $717 million in annual revenue comes from exports, and China is their third-biggest customer after Mexico and Canada. “Hog farmers on trade war’s front line,” by Kristen Leigh Painter, Jim Spencer and Tom Meersman. Front Page- Minneapolis Star Tribune (March 24, 2018). “For corn growers tied to ethanol production, China’s retaliatory tariffs could lead to an oversupply of ethanol that could slow production and perhaps shut down some plants,” the Star Tribune article said. In addition, Wall Street Journal writers David Hodari and Lucy Craymer reported Friday, “The price of soybeans fell 1.7% to $10.12 a bushel—paring some heavier losses—and corn prices fell 1.5% to $3.71 a bushel, with both more than 3% down so far this week on the prospect of less demand from China. Chinese buyers of soybeans, the United States’ biggest agricultural export to the country, are quietly drawing up contingency plans to ensure supplies of critical raw materials in the event of a trade war, sources said. “The fruits of a trade dispute,” by Geoffrey Mohan. 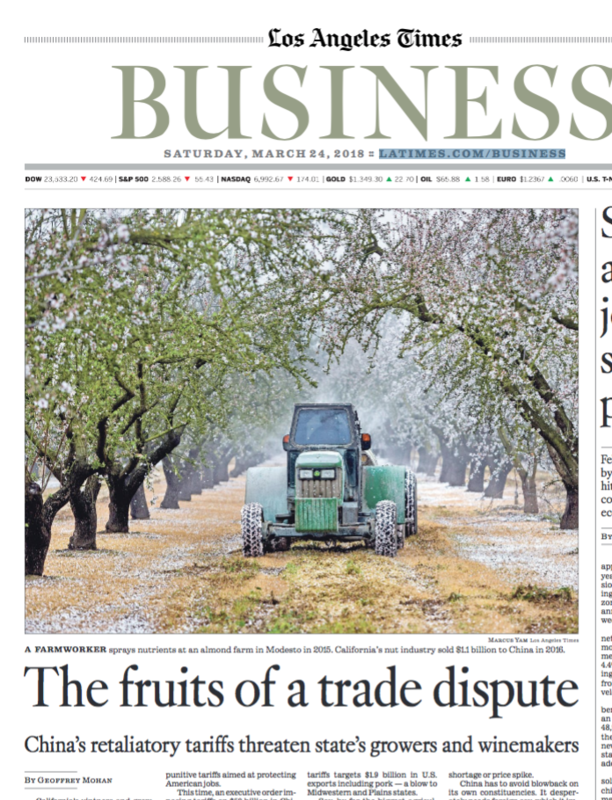 Front Page Business-Los Angeles Times (March 24, 2018). The article stated, “California’s nut industry — almonds, walnuts and pistachios — sold $1.1 billion in 2016 to China, its third-largest foreign customer, according to the state Department of Food and Agriculture. China also bought more than $220 million in fresh citrus and table grapes from California that year, according to the department’s data. “The California wine industry, which has made big inroads to the Chinese market, sold about $197 million of its product there last year, according to the Wine Institute, a California advocacy organization. U.S. wine exports to China and Hong Kong (which often re-exports to the mainland) have more than quadrupled in the last decade and rose 10% last year, according to the institute. And with respect to the timing of the announced retaliation measures by China, Wall Street Journal writers Jesse Newman, Jacob Bunge, and Benjamin Parkin reported on Sunday, “China is the second-biggest customer for U.S. agricultural products after Canada, and its planned tariffs on pork, fruit, nuts and other goods are expected to worsen the U.S. farm economy’s slump. “Farm incomes this year are expected to slide to their lowest level since 2006, according to the U.S. Agriculture Department, prolonging a downturn that has pushed some farmers out of business and eroded profits for seed, chemical and equipment companies. ‘This could not be happening at a worse time for American agriculture,’ said Zippy Duvall, president of the American Farm Bureau Federation. “U.S. pork producers, in particular, could suffer if access to Chinese consumers is curtailed. Hog farmers and meatpacking companies have expanded herds and built massive processing plants on expectations for higher pork exports,” the Journal article said.